McCain 352i ATC Cabinet - J.O. Herbert Co., Inc.
McCain’s 352i ATC Cabinet is an advanced transportation controller cabinet designed to increase driver and personnel safety, and provide state-of-the-art intersection control for any size intersection. Its revolutionary design combines the best of existing standards with the latest technology, while providing a viable migration path to low-voltage intersections. Compact, high density (HD) components enhance operations while providing extra space for equipment or storage. 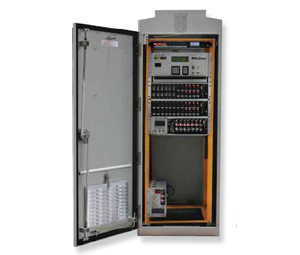 Designed with safety as a paramount feature, the cabinet incorporates National Electrical Codes (NEC), or NFPA 70, by safeguarding users from accidental contact with components over 50V and housing the main circuit breaker at the point of power service entry.